We have been entertaining machines lately — I think partly because it’s June (so many things to celebrate), but mostly because we bought some new furniture for the patio, and we are looking for any excuse to sit outside with one of these in hand, and hang with friends. Dinners have been your typical DALS summer standbys (grilled fish, baby back ribs, yogurt-marinated everything) but lately, we’ve gotten kind of creative with the starters. I thought I’d share a few with you. Deviled Eggs with The Works (above) This one is ripped right from the pages of Canal House Cooks Everyday, a book that should be front and center on your cookbook shelf. (Unless you have something against simple, elegant food.) 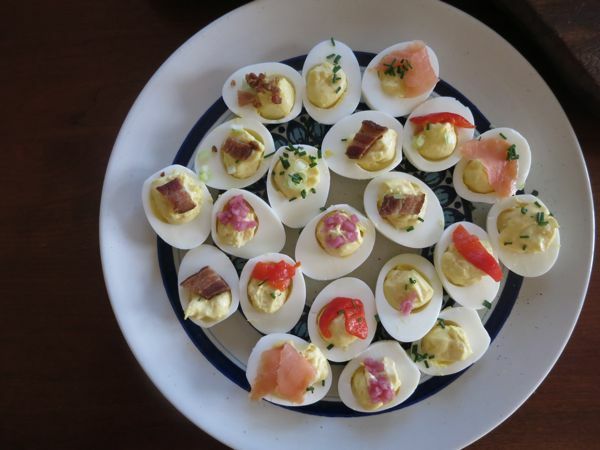 They’re deviled eggs, topped with various trimmings: roasted red peppers, smoked salmon, pickled onions, snipped chives, and bacon. (Leave a few unadorned for the kids.) You can make them ahead of time and chill in the fridge. Always key. Potato Chips with Caviar and Creme Fraiche Now, just to be clear, caviar is not something that happens every day in our house. (We had some very special guests and the mandate going in was “We Are Leaving it All On The Field.”) But every time we eat this little starter, I start figuring out ways to justify the expense. 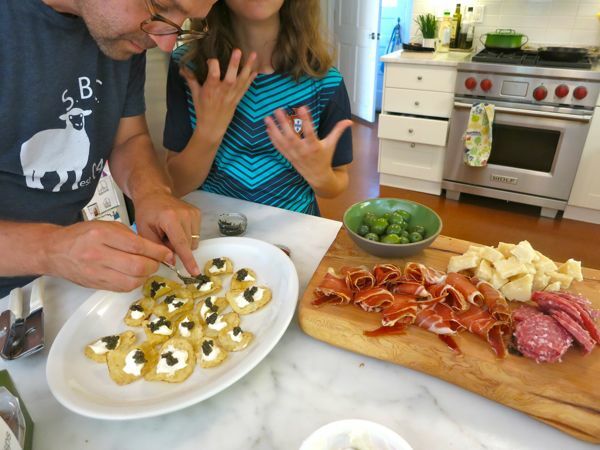 We picked up American Caviar at Whole Foods (about $18 for a small tin — I know, ridiculous, but when you think about a hunk of Parm costing upwards of $15…well you see what I mean re: Justifying) and served them on top of plain old Kettle Chips for some high-brow/low-brow action. 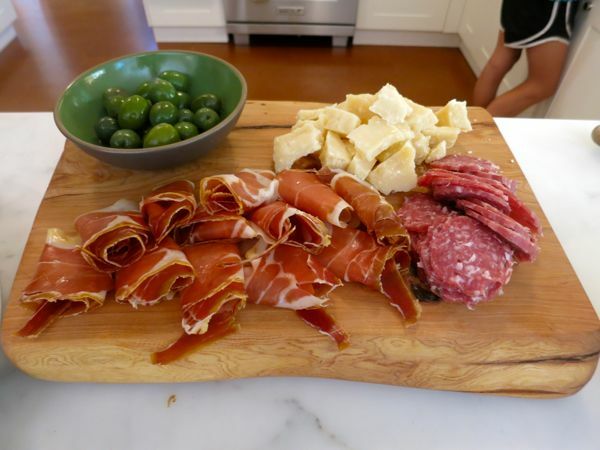 Meat Lovers Delight Can’t go wrong with serrano ham, sliced pepperoni, olives, hunks of Parm, and (not shown) crispy baguette slices. If your kids are like mine, try to keep this display somewhere they can’t reach it, or else risk running out of food before the guests arrive. thanks! i’ve been in a appetizer rut lately…hummus, olives, blue cheese…good to be reminded we have other options! Yum, these all look great! Especially love the Burrata – so simple and delicious and always a crowd pleaser at our house when we entertain! 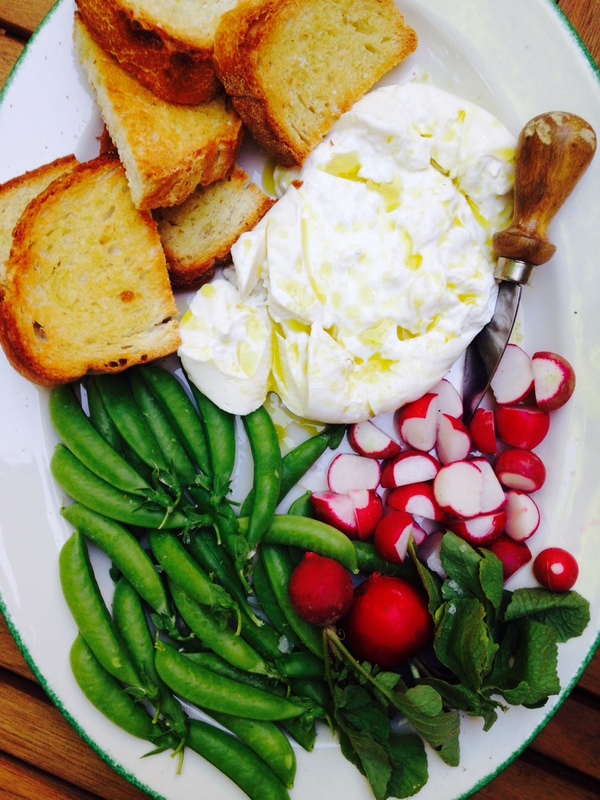 M.
Our CSA gave us radishes & sugar snap peas this week, & I randomly picked up some burrata yesterday. Just need to get some crusty bread…thanks for the food pairing idea! Oh my goodness. Boquerones (little vinegar-marinated anchovies from Spain) on potato chips is my favorite appetizer ever. Caviar and creme fraiche on chips is genius! Those potato chips look like bankruptcy on a plate. Because I would eat them all in two seconds and immediately have to make more. i need that burrata now. Love these ideas – so yummy! Back from Montana and getting caught up on your blog 🙂 Love these ideas. We are burrata phenes over here! I could live on this type of food in the summer, forget dinner lets keep snackin’! Inspiring ideas….love the potato chip and caviar combo! Great ideas to share with family and friends. Perfect for a summer night on the porch. Burrata and Baguette… you cant go wrong! Caviar??? I love your blog, books and recipes but I think you are losing part of your audience when you can easily justify buying the stuff. What happened to the Jenny that would justify not attempting a new bread recipe because of the cost of one of the spices or the Jenny that made notes in her diary that out-of-season raspberries were too pricey for entertaining? Jenny, you’ll never lose me as an audience member. I love your ideas and if one of them isn’t for me, it’s not a problem. I happen to LOVE the idea of caviar on chips. I’ve never eaten caviar, but now I’m motivated to. The highbrow/lowbrow vibe is genius! I justify Reggiano Parmesan while others may feel it’s too pricey. That doesn’t mean we can’t be food friends anymore. I may make all of these starters and the Dark and Stormy and call it dinner. I haven’t had caviar since I was 12…and while I promptly spit it out, I think now at 26 I could get behind it….as long as a kettle chip was the vessel! The burrata and veggies looks like a religious experience, even with the chrome filter. Burrata? Never had it before but can’t wait to try it. Do they have it at Trader Joe? We love cheese plate w/ cheese, meats, jam, and candied nuts..of course bread!! Easy and fun dinner! Now to hunt for the Burrata..
Prosciutto and cheese = me swooning! Burrata is my everything!! And the picture looks great. I’m a fan of cold soup in the summer- have a look! I love having appetizer nights. I’m imagining such a lovely night on your patio with these elegant apps. It looks so delicious. I love your ideas! I am the meat lovers! Oh man I could live on deviled eggs and burrata, summer entertaining is just the best!